And before that, each day will hopefully see the completion of one entire entremets. 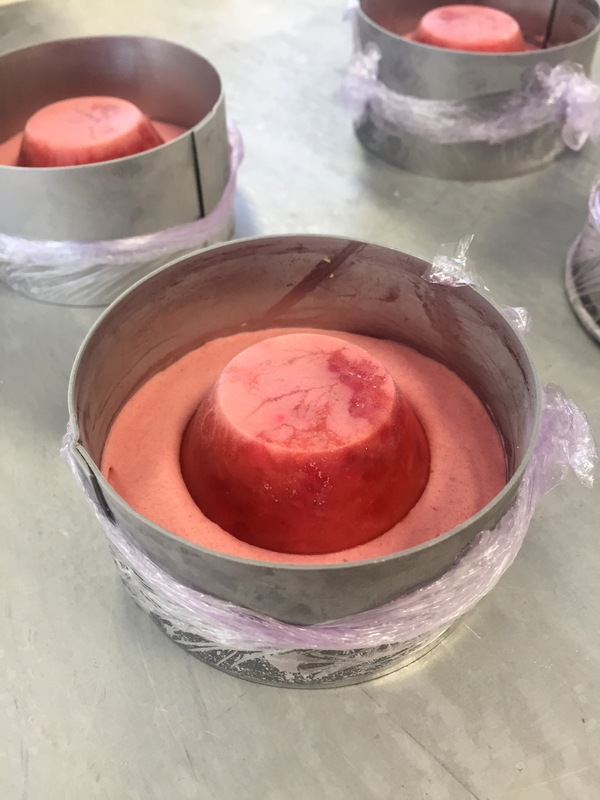 The one recipe that isn’t able to be made within one class time is the inverted puff pastry–which needs two days to rest in the fridge–so we started off our week by gathering the ingredients for that recipe as well as for the rest of the recipes for todays Strawberry Entremets. Much like with plated dessert week, each team of two people was in charge of one recipe which would later be added to the larger, complete cake. My lovely partner and I were in charge of the Vanilla Biscuit–which smelled like absolute heaven! The recipe originally called for vanilla beans, but instead we used a really good quality vanilla extract. And let me tell you, it was liberally added to the biscuit. I kind of wanted to stick my face into the bowl directly, but I refrained. After the biscuit was completed, we went table to table to complete and understand the remaining recipes. I really am beginning to enjoy this style of learning, because it gives me the opportunity to observe and ask a lot of questions–and it also means less utter chaos in the dish area every single time we make a recipe. Since all eight of us are making one entremets together, the mold we used was 40×60 cm. Yeah, huge, right? Needless to say, adding some of the layers was a bit of a hassle. 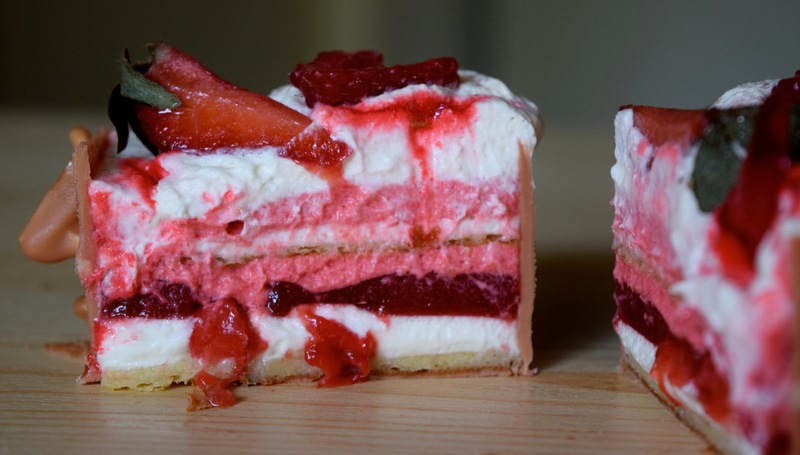 For example, after a beautifully smooth layer of Vanilla Cream on top of one layer of Biscuit, we somewhat haphazardly added the Strawberry Insert, smoothed over some Strawberry Cream…….And then absolutely demolished our second layer of biscuit while trying to transfer it. Like, seriously. It crumbled to the table, and then we tried to puzzle-piece it back together for awhile before sticking it into the glace freezer. 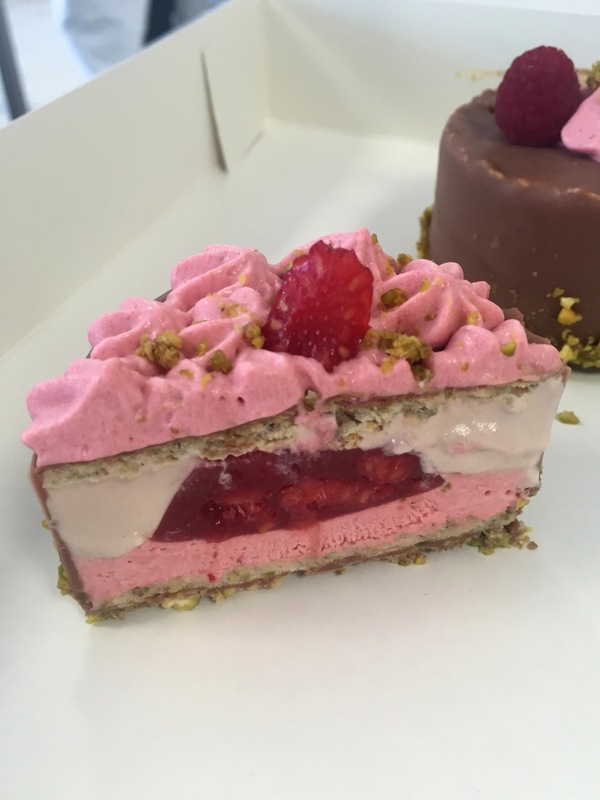 After that Chef decided that instead of rushing to finish everything and ending up with a less than perfect entremets, we would do our cleaning and slowly finish stacking our strawberry entremets, and cut the cake and add the glaze tomorrow. Somehow we still managed to finish everything a solid 15 minutes before class was to end, so for once we were able to do some prep for the next class. (Which, of course, then made us get out of class late because we had to clean up the things we prepared T_T). 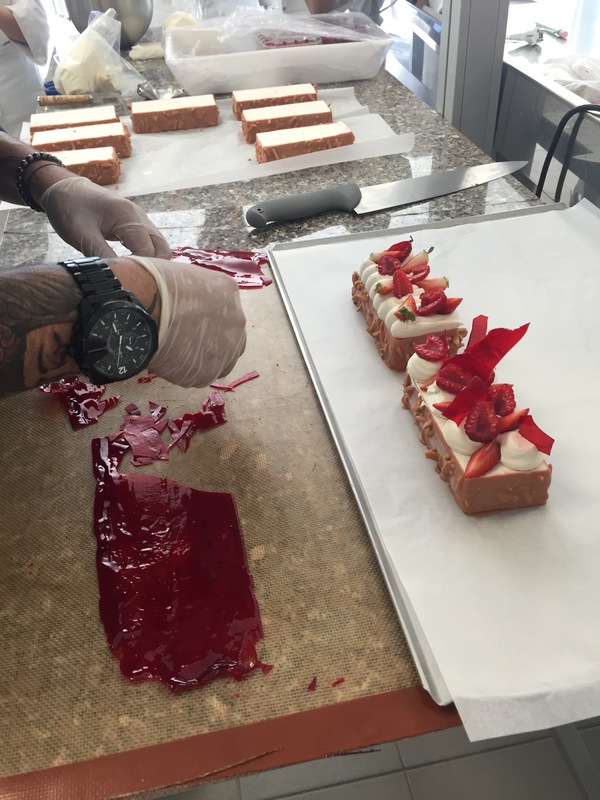 Tuesday started with a double fold of the inverted puff pastry and finishing the strawberry entremets from Monday–which entailed cutting it into rectangles, coating it in a chocolate glaze, and decorating the top with chantilly, sliced berries and shards of red sugar. I have never tasted something that tasted more completely like the essence of summer. It was so vibrant and and fresh, creamy with a bit of a crunch. Absolutely amazing. We had to work on our Exotic Entremets after that, which called for completing creams, biscuits and an exotic glaze for our dome shaped entremets. 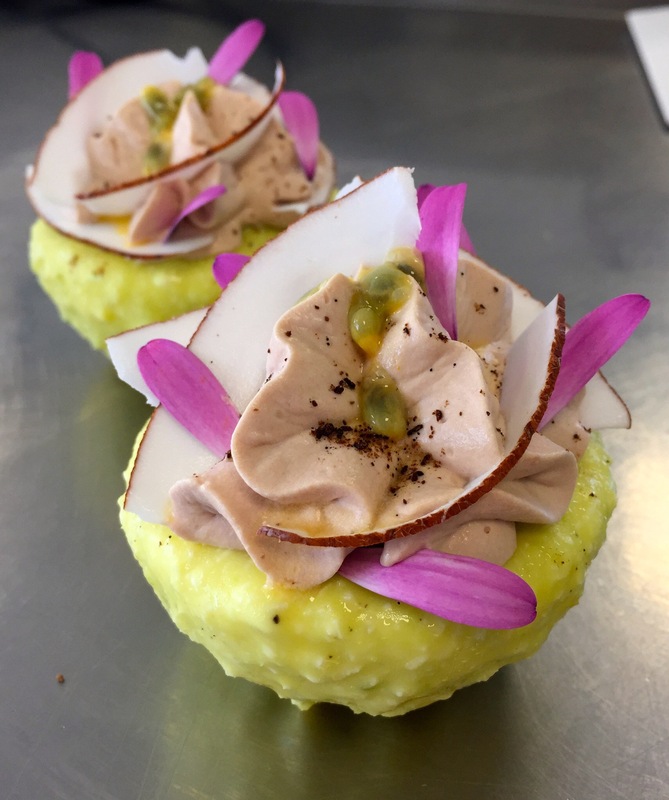 I did not expect the entremets to end up looking like they did–with the flat side of the dome facing up as a surface for decoration–but it was fantastic because it meant we could pipe our chocolate chantilly on top and add fruit, coconut and flower petals on top of the little entremets. The exotic entremets–which were finished on Wednesday because, have I mentioned, we are incredibly slow–were adorable to cut into because of the shape and layers, but the biscuit is unfortunately much more brown than it should have been because someone *cough*me*cough* forgot about them in the oven. (Though in my defense, we all knew they were in the oven and none of the other 8 students remembered to check on them or take them out either….). Wednesday also brought my favorite dessert of the week. Yep, you guessed it, it involved caramel. 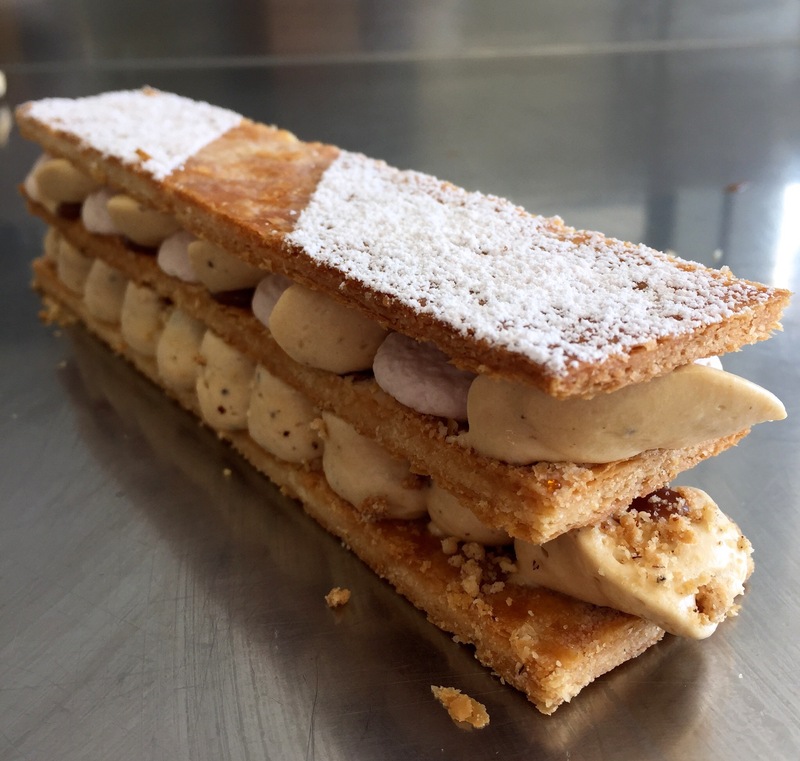 Finally the inverted puff pastry dough that we had been working on all week came into play, and we made the most magnificent Mille Feuille out of it. You also know this entremets is really amazing, because the roomie who doesn’t like sweet things and is the queen of cuisine and creating balance in a recipe thought this dessert was incredible. I also somewhat successfully (thank you Chen) piped the squiggly line of caramel creamly, and considering it was the first time I had ever piped like that, it was incredibly satisfying. On Thursday we made “eclairs,” and I learned that eclair means lightning in French. So now the magical foreign element that the name of the dessert always encased is a bit ruined…. I blame Chef. Just kidding. But really, who knew elegant eclairs were really just named after lightning!? 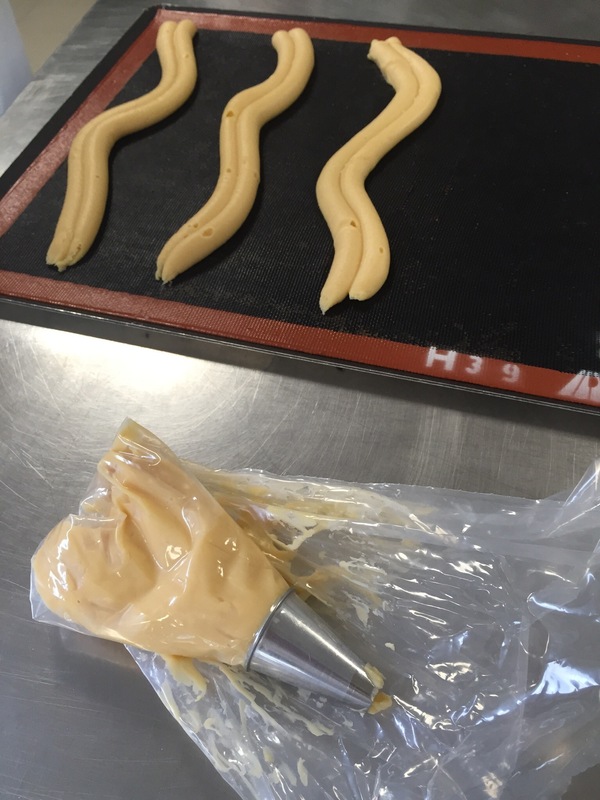 Our eclairs also ended up looking a bit like lightning, as we piped long waves of choux dough across our prepared trays. 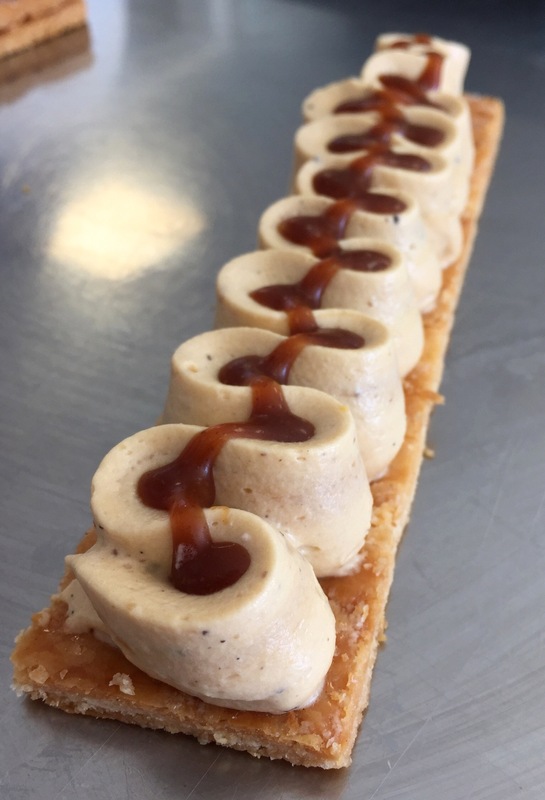 This was the first time I had ever made an eclair, and it was also the first time to see an eclair approached in such a manner. 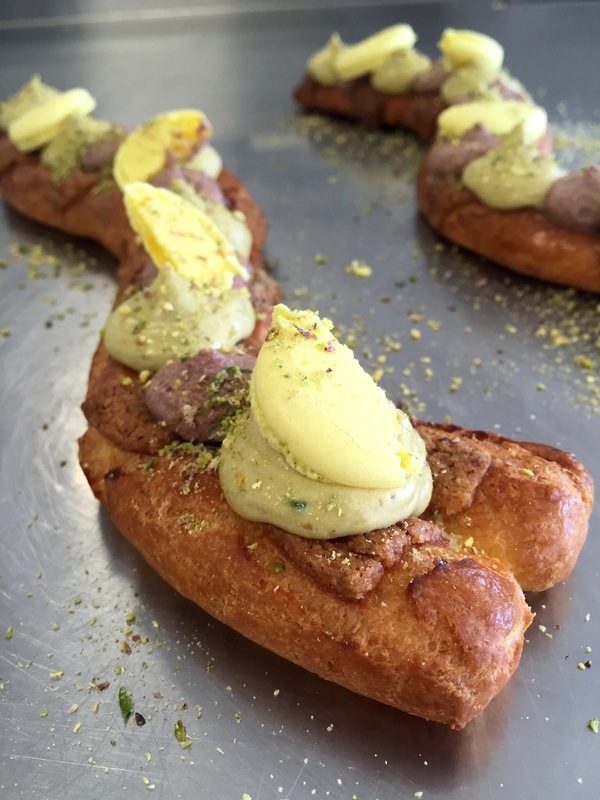 Not only did we pipe them in wave shapes, we also didn’t cut into the dough–rather we piped our pistachio and chocolate creams on top of the eclair along with a pistachio caramel. You probably know by now that I am not the biggest fan of pistachio, but this dessert was incredible. 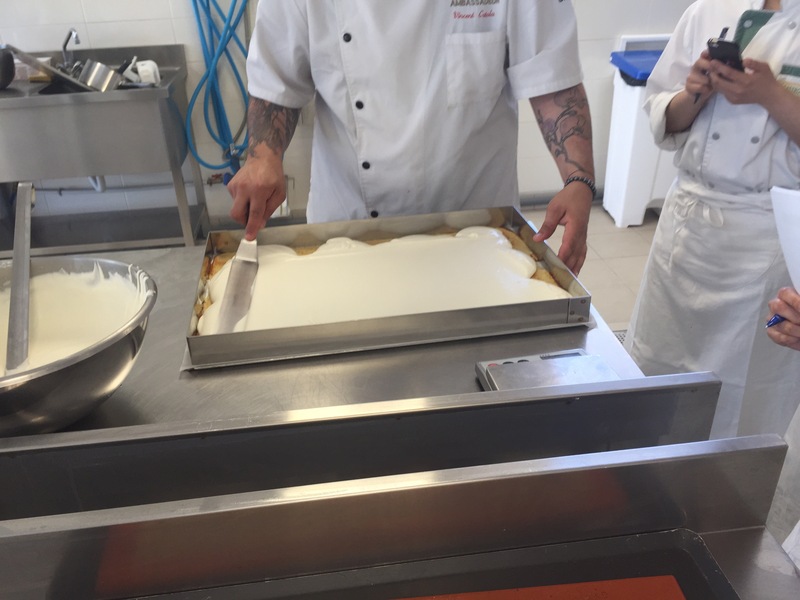 Thursdays eclair dessert was simple so that we could finish our deep clean at the end of class in anticipation of the test on Friday. Forgot about the test while I rambled about delicious things? Haha…I didn’t. At all. My partner Clarine and I got together Thursday night to discuss our recipes and ingredients and make sure we knew the game plan for Friday–and having only thought about the dessert from Wednesday night and having not tried anything out after school, there was not a high level of confidence going around. Friday morning we got to class and immediately started working on our individual entremets for the test. 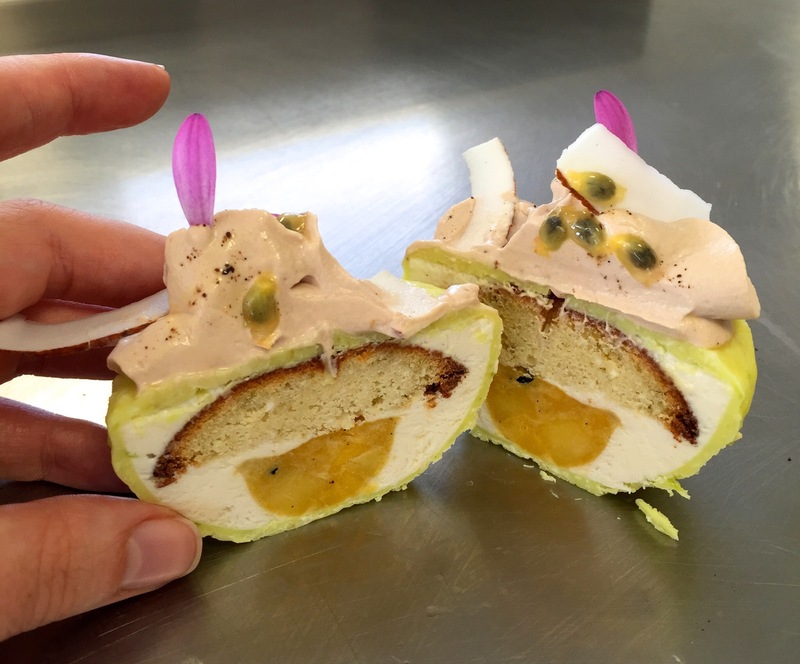 The rules were to use recipes and techniques we have been working on to create a unique entremets within two and a half hours–working in teams of two. 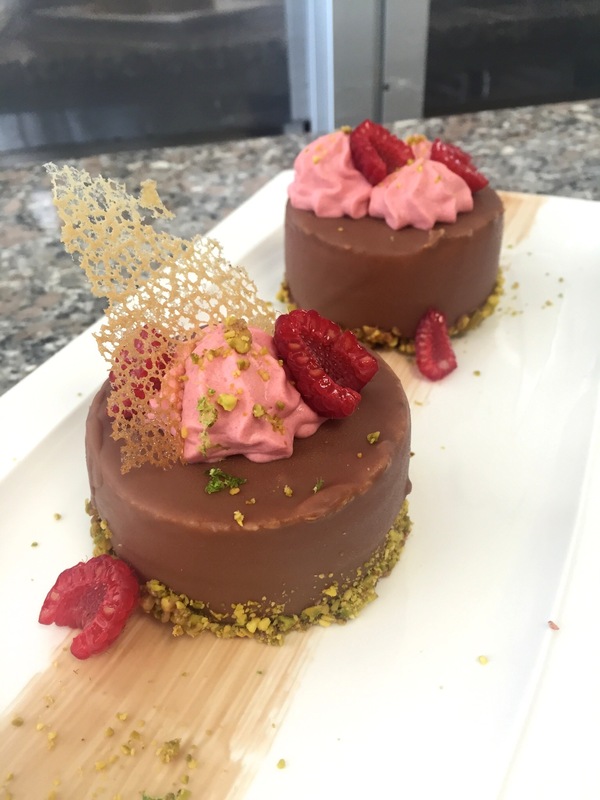 Clarine and I decided to make milk chocolate, pistachio and raspberry entremets and it went…adequately. On the plus side, we finished everything on time and it didn’t completely fail. On the negative side, it didn’t look as nice as I wanted it to, it didn’t taste exactly how I wanted it to, it was bigger than I wanted it to be, and it really didn’t reflect my image of pastry or what I believe I am capable of. In short, I’d like a do-over. But in the end, it was appreciated by my friends who devoured the desserts after class–and if that isn’t the point of making pastry than what is? Maddie! I hope you know that reading your blog while hungry is torture.